Kenwood DDX9703S Review: Do the Features Match the Price Tag? 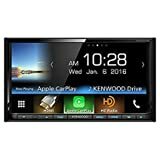 One of the most popular head units on the market right now and a product that we get asked about a lot is the Kenwood DDX9703S DVD receiver head unit. It’s competitively priced, it looks fantastic and it seems to be packed full of all the features that you need from a head unit, but is it worth the money that they are asking for? The Kenwood DDX9703S is a double din that you can have fun with. It's huge display is great and responsive while it's features work for everyone. The equalizer is one of the better ones on the market. It would have been nice to be able to turn off that legal disclaimer, though. What Exactly Can the Kenwood DDX9703S Do? If you are currently shopping around for a multimedia head unit, you probably already know what sort of features you are looking for and what you can expect. With that being said, the DDX9703S surprised us with the amount of features that it has for such a reasonable asking price. The receiver can connect to both Apple (via Apple CarPlay) and Android devices (via Android Auto), giving you the ability to control everything from your smartphone to all of your music and video. The 6.95” display is bright, colorful and touchscreen. It also connects to your phone via Bluetooth to enable hands-free calling as well as music streaming from apps like Spotify or Deezer. If audio streaming services aren’t your thing, the DDX9703S also has a built-in HD radio tuner that produces a sound that is as close to CD quality as you can expect from a radio. One of the coolest features in our opinion is the “Siri Eyes Free” functionality. Of course, this feature is only available for Apple users, but it’s still pretty neat. Just one touch of the screen will activate voice commands, allowing you to place calls, change songs and even create and send text messages. For those who like to get hands-on with their sound, the DDX9703S also has a built-in 13-band equalizer, allowing you to fine-tune the sound exactly how you like it. The built-in amplifier does a great job of producing clear, clean and quality sound. It also has an auxiliary input that allows you to play almost any file format including FLAC, AAC, and WAV. There are countless features that we enjoy using on the DDX9703S, but when we are comparing it to other products at a similar price range, the pros become evident pretty quickly. First of all, the 6.95” display is stunning. It’s not just the size that makes it impressive, it’s the contrast of the colors and the clarity of everything. You can also customize the display to suit the surroundings of your car by choosing one of the display colors or backgrounds from the huge collection that they offer (Over 30,000). While it does have a lot of cool features and modern adaptations that you would expect from a piece of technology in this day and age, it hasn’t forgotten about the older functionalities that many people still appreciate – CD/DVD players and radio. The HD radio is clear and can pick up local radio stations very well. It can also stream internet radio stations through your smartphone if that’s something that you are into. The equalizer is probably our favorite feature of the bunch. The 13-band equalizer lets you pick and choose exactly what you hear through your speakers, allowing you to find the perfect sound. It uses digital sound processing and digital time alignment to produce a consistent sound, regardless of the outside noise. The built-in 4-volt preamp outputs will never be as good as a dedicated amplifier, but they do a great job of sending clean, distinct signals to your speakers, producing high-quality sound. 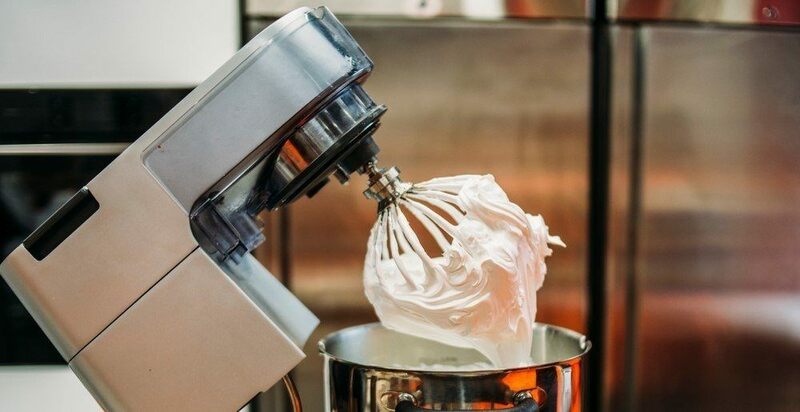 Fun fact: The audio manufacturer Kenwood and kitchen appliance manufacturer Kenwood is not the same company. One is based in Japan and the other in UK. 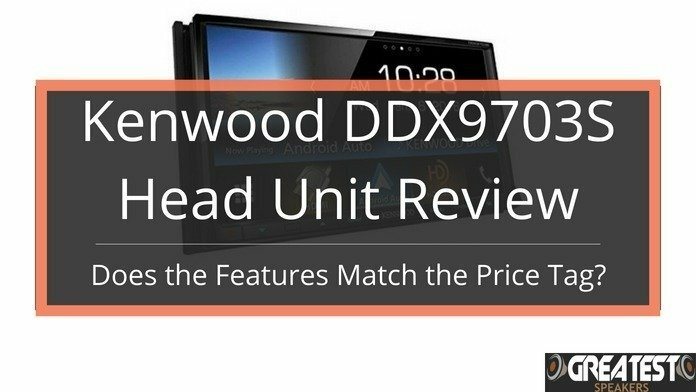 While the DDX9703S does have a lot going for it, and in our opinion, is one of the best head units on the market at the moment, it wouldn’t be a fair review without us at least mentioning the downsides and the cons of this product. First of all, as good as the 6.95” display is, it’s not that great during high sunlight. Of course, you can still see it pretty clearly, but there does tend to be a lot of reflection when the sun is at its peak. This could be an issue for those with poor eyesight as it could require more attention to operate. Another slight annoyance is the fact that a legal disclaimer pops up every time the car is turned on. This isn’t really a con, but it does get a bit annoying to keep having to close it every time you turn on the car. It comes in at around fair price which is either expensive or cheap depending on what sort of other products you have been looking at, but regardless of the price, it’s a feature packed head unit that is worth every single penny. It looks great, it has a ton of features and customization tools and it’s easy to set up. What more could you want from a head unit? 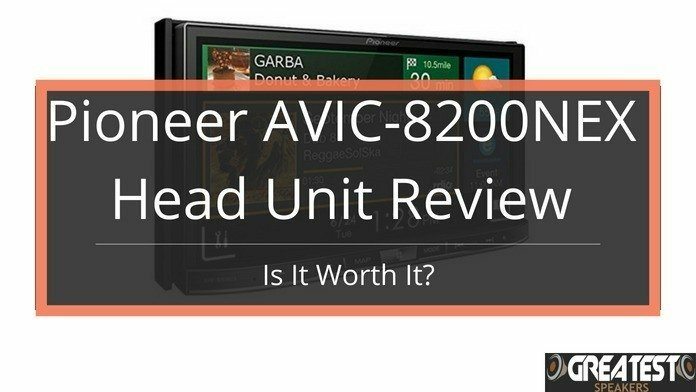 Pioneer AVIC-8200NEX Review: Is It Worth It?